Run of the river hydro electric systems use water which is flowing in a river to generate power. They don't store any significant amounts of water. Run of river hydro usually involves a low level diversion weir or a stream bed intake and is usually located on a fast flowing, non seasonal stream or river. Damless hydro is another form of run of river hydro. 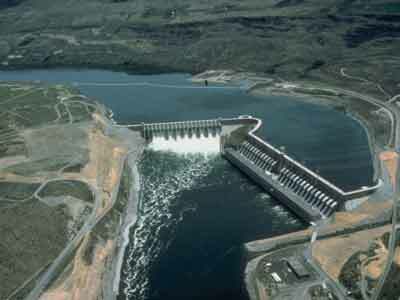 Image: Chief Joseph Dam - a large run of the river hydro plant. A low level diversion weir raises the level of the river water just enough so that a structure for intake can be situated on, or next to the river. The intake has a debris screen and a submerged opening with an intake gate. A stream bed intake requires no weir. The water drops through a screened inlet duct which is flush with the bottom of the riverbed. It is necessary to flush out debris, as rocks and gravel will enter a stream bed intake. With either setup, the water is carried downhill through a pipe (called a penstock) to a power station downstream of the intake. The power plant is located at as low a level as possible to gain maximum head on the turbine. The water leaves the power plant and is returned to the river without altering the existing flow or water levels. Most run of river power plants will have a dam across the full width of the river to utilize all the river's water for electricity generation. Such installations will have a very small reservoir behind the dam. As there is minimal (if any) flooding, they can be considered "run of river". Stand alone run of river hydro systems are used to provide power to homes, farms and small commercial businesses. There are also a number of commercial electricity generating plants feeding the energy grids around the globe. Before considering this type of hydro system, the site must be assessed as having sufficient volume of falling water in the stream or river. From an environmental perspective, a general recommendation is that no more than 20 - 50 percent of a creek's flow should be diverted for a run of the river hydro system. Damming and flooding the river is not required as run of the river hydro systems don't need a reservoir. Great for small hydro setups. The output of the power plant is highly dependent on natural run-off. Spring melts can create a lot of energy. Conversely, dry seasons or drought will result in little energy output. This disadvantage can be reduced if a site with consistent flow is chosen. Commercial sites are limited or extremely remote resulting in reduced commercial viability.